Soap balls are a good gift for the women in your life who like decorative soaps in their bathrooms. Growing up, my grandmother and great-grandmother always had little decorative soaps by the bathroom sink. They’re also good exfoliating after work that is hard on your hands, like gardening. I make ones with pascalite clay for folks with oily skin. I use artisan-crafted soaps at home, but because these are for a gift, I used the brand of soap the recipient prefers. This method will work with any bar soap that is a true soap (Dr. Bronner’s, artisan soaps) or a detergent-base bar (Ivory, Dove), either commercially-produced or hand-made. It will not work with glycerine bars. Unscented without solid additives like oatmeal or herbs work best, but you can use any scent or color you’d like if you don’t want to have to add them during the process. You’re going to need bars of soap, a grater, a small bowl, a spoon, some warm water, and if you’d like you can have additives such as oatmeal or clays safe for external use such as pascalite or bentonite, essential oils and natural food colorings. If you’re going to use an additive such as oatmeal or dried herbs for exfoliation, you will want to place it into a blender and pulse about ten times or until only small pieces are left. Set it aside. If you’re using a natural food coloring, dissolve a little into two teaspoons of warm water until you reach the color you desire and set aside. Then grate your bar soap on a large-holed grater. You want large flakes since they’re easier to work with. Grab a bowl and place one-quarter of a cup into the bowl. 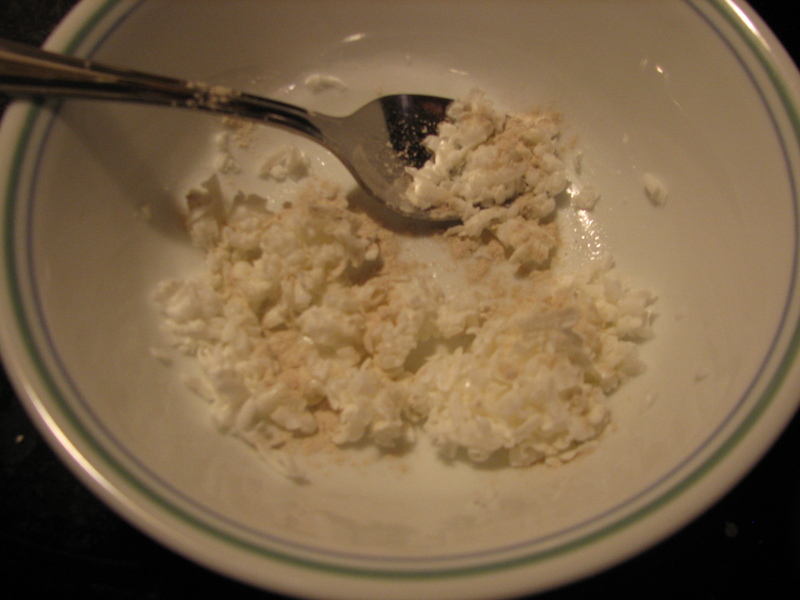 Then add up to a half-tablespoon of oatmeal or other additive or an eighth-teaspoon of clay, such as pascalite. Pictured here is pascalite. Add two or three drops of essential oil and stir. Then add a half-teaspoon of water, stir well and give it a few minutes to begin softening the soap, stirring occasionally. Depending on what type of soap you’re using, how dry it is and what type of additives you’re using, you might need to add more water and allow it to sit for longer. You want the soap to soften but not become wet enough to squeeze water out of it. So aim for slightly moist and allow it to sit so it gets very soft and workable instead of over-wetting it. 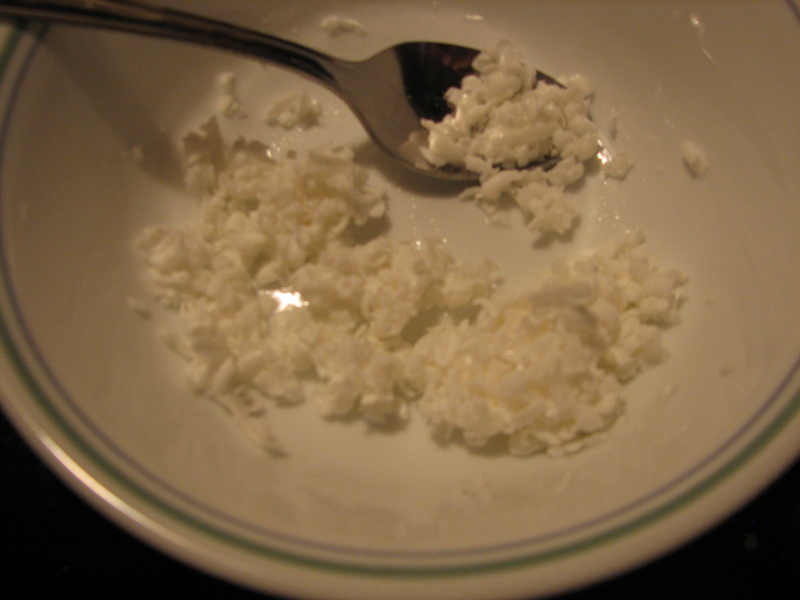 If you add too much water, add more grated soap to absorb the excess moisture. Stir the soap until it’s broken down and uniform. Smell it and decide if you need to stir in more essential oil. 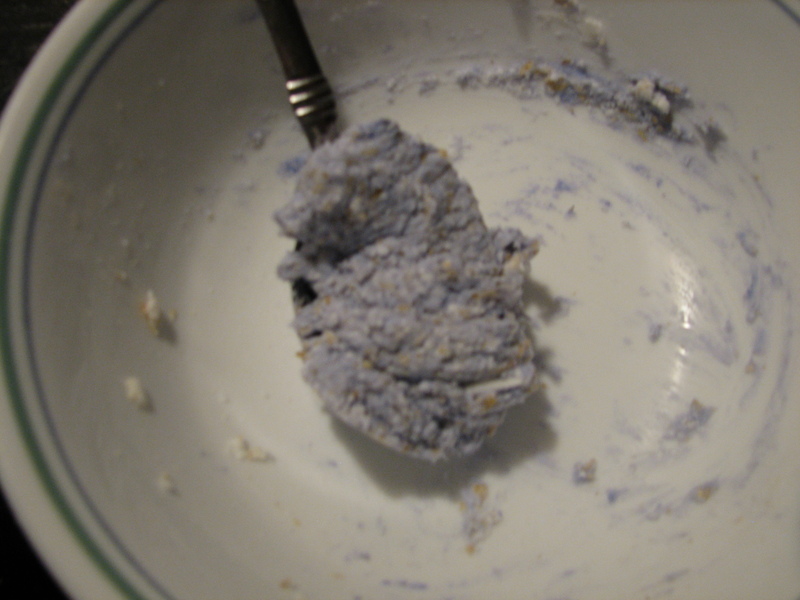 Then using your spoon, scrape the soap up into the spoon and take it into your hand. Roll it into a ball. Set the balls to dry for 48-72 hours, then they are ready to be wrapped for gift giving. Check them every 12 hours or so and re-roll or mold with your fingers to smooth out any lumps or bumps. 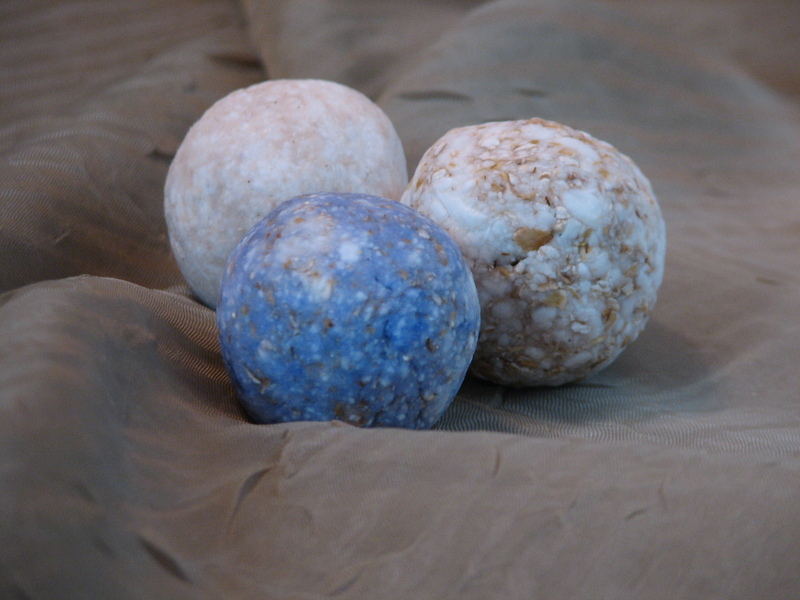 I made three types of balls this session- pascalite clay with rosemary essential oil to the left in the back, oatmeal with lavender oil to the right in the back, and oatmeal with lavender oil and a little food coloring which is front and center.